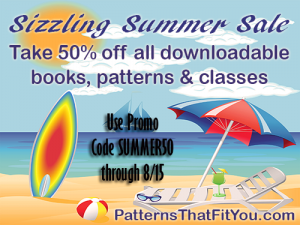 Today is the first day of summer, and we can’t wait to announce our Sunsational Summer Sale at PatternsThatFitYou.com. You can get a WHOPPING 20% off your entire order — AND that includes our Value Packs that include over $50.00 worth of current “off the shelf” sewing notions, interfacings, elastics, thread and much more for only $19.95. With the 20% discount, you’ll be getting the Value Pack for $15.96. WOW! $50.00 + worth of sewing supplies for $15.96 — you just can’t beat a deal like that. Use the promo code SUMMER when checking out to get the 20% discount. 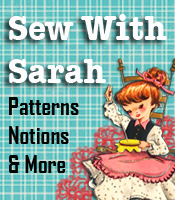 PatternsThatFitYou has a wide variety of sewing, crafting and pattern making books, classes and patterns. We specialize in patterns and classes for Plus Size Children, Full Figure / Plus Size Women and Big/Tall Men, in addition to many sewing and crafting books for your sewing library. If you’re looking for sewing machine, serger and/or treadle sewing machine repair books, visit the SewMachineRepair website.